Allison Brown makes it all appear so effortless. She is blessed with one of those big voices that can fill a room and the sense to hold back from belting that voice up to the rafters with all her might. 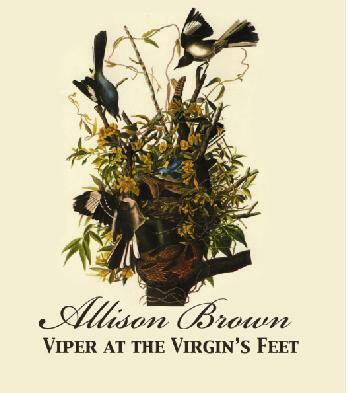 In her new album, Viper at the Virgin's Feet, Allison Brown uses her gift wisely, imparting the primarily gospel and roots recording with a powerful yet smooth depiction. The album was recorded in two parts, a large portion at the island studio and under the tutelage of legendary producer, David Essig, and the remainder half a nation away in the heartland of southwestern Ontario, but the resulting recording has a beautifully cohesive feel. It's a compelling mix of original, traditional and cover songs, that showcases Brown's songwriting talents while paying homage to troubadours who have gone before. It's the mixture of such solid original tracks as the sprightly All The Birds, the whimsical If I Was a Weathergirl and the darkly yearning Something Holy, amongst such standards as Towne Van Zandt's Poncho and Lefty, Patty Griffin's heartbreaking Long Ride Home and Iris Dement's Our Town, that makes Viper at the Virgin's Feet such a deeply satisfying album. Brown's treatment of the covers and the standards is respectful and faithful to the original, but she manages to impart her unique stamp through gutsy arrangements and a voice perfectly suited to the joy of a gospel hymn and yearning of a roots refrain. There is something for everyone on this album - holy roller harmonies, wailing harmonica, plucky mandolin, weeping violin, quietly assertive bass. There is the quickening power of religion on the edge, the beautiful melancholy of aging and loss, bittersweet respect for bandits, and reminiscence for life's longings. When I find myself playing this album, as I have been doing a lot lately, I always find myself singing along. For I have been moved. She's great, isn't she, Kelly? And I have it on good authority she loves playing out your way. Such a lovely review Barbara, it sounds like I will have to check out Ms. Brown soon. Oh yes, you must, Dale. You can even catch her shows around town if you feel like venturing out some evening. I love that line too, Phlegmmy! Being beautiful is a full-time job. So glad to hear that you enjoyed Allison's music, as well as Frightened Rabbit! Very different musically, but both very satisfying.